Paramount Advanced Technologies’ (PAT’s) Mwewe unmanned aerial vehicle (UAV) has been used to get type approval for Cobham’s Aviator UAV200 satellite communications terminal. 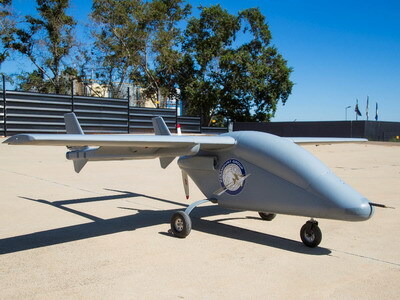 The Mwewe UAV is a quarter scale model that was built to assist with wind-tunnel testing for the AHRLAC (Advanced High-Performance Reconnaissance Light Aircraft). Cobham SATCOM has been working on the development of a very small, low weight Inmarsat Swift Broadband terminal specifically targeting small tactical UAVs. The intention was to allow airframes with a long endurance to optimise their use in Beyond Line of Sight mode (BLOS), using a lightweight Satcom terminal (weighing only 25% of previous generation units) with communication via the Inmarsat satellite network and base-station. As a result, Cobham claims the Aviator UAV200 is the world’s smallest, lightest Inmarsat UAV satcom solution at 1.45 kg. PAT’s involvement was to integrate the Aviator UAV200 terminal into Mwewe. Provision was also made to send commands via the Satcom network to Mwewe (such as to update the flight-plan, switching of lights, etc.). “The project was successfully completed in parallel with other UAV projects, showcasing the commitment of the PAT workforce to be part of exploring new technology to expand on our product offering to both existing as well as potential UAV clients in the future,” PAT said. Cobham SATCOM has now obtained type approval by Inmarsat and is taking on orders for this product. “We are confident that with such new technology being integrated, tested and qualified that we can secure future business in the UAV domain for the benefit of our clients,” PAT said.